Problems with vision are unfortunately one of the effects of diabetes on vision. There are different diabetic retinopathy stages which can oftentimes affect the vision. It’s important to point out that if you have diabetes and notice a difference in your vision, it’s best to speak to your doctor about what you are noticing. The earlier to begin diabetic retinopathy treatment, the better the outcome. If you haven’t been to the eye doctor for a while, it’s time to make an eye appointment. Regular eye exams can help you avoid diabetic eye problems in the long run. Learn more about the affects of diabetes on your body here. Diabetes affects various parts of your body, one of them being your eyes. Having high blood sugar can cause problems in your vision. You may notice these problems as blurry vision, cataracts, glaucoma and retinopathy. Diabetes is one of the lead causes of blindness in adults, which is why it’s important to be informed about the diabetic retinopathy states and treatment to keep your eyes healthy. Here is a list of a few of the diabetic eye problems that can emerge and what that means for you. Blurry vision: Blurry vision can be a result of high blood sugar, making your lens swell, changing your ability to see. In order to change the blurry vision getting your blood sugar back at the target range can help aid this issue. 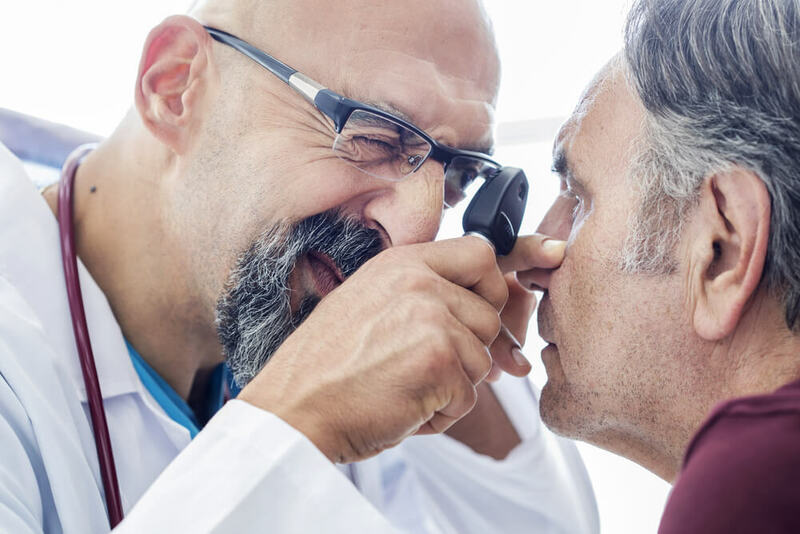 Cataracts: Anyone has the possibility of getting cataracts, but individuals who have diabetes have a much higher chance at developing them earlier, and more severe. Cataracts make focusing difficult because they cloud the normally clear lens of your eye. Glaucoma: Glaucoma can be treated by medications but it can cause vision loss. Glaucoma can be noted by pressure built up inside the eye because the fluid can’t drain like it should. This can cause damage to the blood vessels. The retina are the cells in the back of your eye that allow the intake of light. The retina turns the light into images and then send it to the brain. If you develop Glaucoma or other diabetic eye problems, damage to the blood vessels can cause changes in the eye. These changes can lead to diabetic retinopathy. Holes or black spots in your vision. If you have noticed any of these symptoms and you have diabetes, you should make an appointment to see your doctor as soon as possible. In order to slow the progress of diseases such as diabetic retinopathy, controlling your blood pressure, blood sugar and cholesterol can help you do so. If you are a smoker, quitting can not only help your overall health but also your eyes. Diabetic retinopathy treatment can include photocoagulation which is a procedure that seals leaking blood vessels in the retina. Although it sounds painful, the procedure does not hurt. Another diabetic retinopathy treatment could include vitrectomy which occurs when the blood vessels leak into your retina and vitreous humor. A Vitrectomy removes the blood that has leaked, allowing you to have less cloudy vision. The prevention of diabetic eye problems begins with regular doctor visits as well as keeping all your blood sugar and pressure levels in target range. Make sure to point out any changes you notice in your vision to your doctor to catch any sort of problems early.